Magallanes, Buendia, Guadalupe, Shaw Boulevard, SM Megamall, Boni Serrano, Cubao Farmers, and Ermin Garcia. 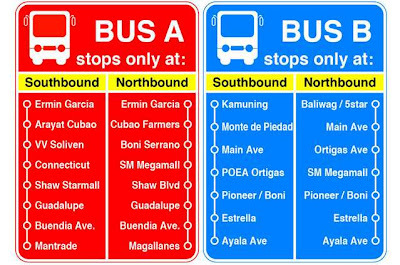 Southbound: Ermin Garcia, Arayat Cubao, VV Soliven, Connecticut, Shaw Starmall, Guadalupe, Buendia Avenue, and Mantrade. Ayala Avenue, Estrella, Pioneer/Boni, SM Megamall, Ortigas Avenue, Main Avenue, and Baliwag/5 Star. 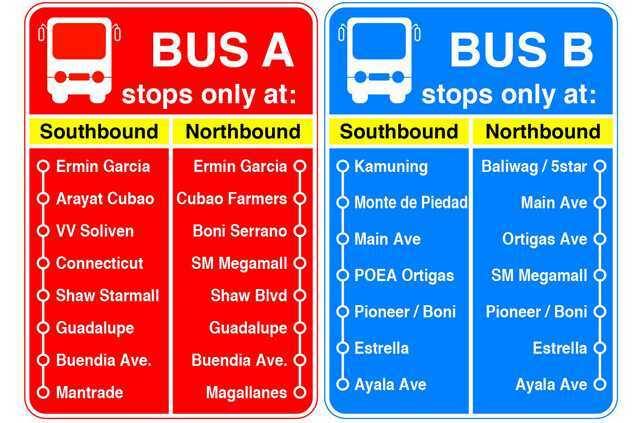 Kamuning, Monte de Piedad, Main Avenue, POEA Ortigas, Pioneer/Boni, Estrella, and Ayala Avenue.